I can’t find the words to express the sheer brilliance of this novel. Since starting my internship at Allen & Unwin, all the marketing team could gush about was how amazing Crazy Rich Asians was. I received an ARC of it a few weeks ago from them, but thought nothing of it. In my head, I was thinking about the pile of books already on my TBR pile, and as I don’t read a lot of chick lit, Crazy Rich Asians wasn’t exactly on the top of that list. And boy, do I regret not having picked it up sooner! Because now I can’t stop gushing about it either. I’m not sure what compelled me to finally pick up the book, but I’m glad I did, because this book and I just clicked so well together. I found myself nodding along to so many of the scenes, and felt so proud to be reading a book that is based on my cultural background. Crazy Rich Asians is predominantly the story of Rachel Chu and her boyfriend Nicholas Young, who are both university professors in New York. Nick has invited Rachel to spend the summer with him in Singapore, following the wedding of his best-friend where he’s the best man in the wedding. As Rachel agrees to go to Singapore with Nick, she soon realises that she barely knows anything about his family and believes the reason for it is because Nick comes from a humble home, which he’s embarrassed about. But what Rachel doesn’t realise is just how wrong she was – because Nick and his family is crazy rich! And so begins her journey amidst a family that do not want her. In the front of that line is Nick’s mother Eleanor, who has extreme feelings as to who her son should and should not marry. And she would do almost anything to ensure that ‘bad’ blood do not breed into her family. One of the shock values of this book is reading about the shameless ways Eleanor and her friends go about to sabotage Rachel and Nick’s relationship. As someone that’s grown up in Australia and has been culturally integrated into the dynamics of this country, I was gaping open-mouthed at some of the bitchy stincts that a few of the characters did. This novel jumps between different characters, and I often had to flip back to the family tree at the front of the book just to double check who everyone was. But one of the main reasons I loved this book was because of the main perspectives I got to read about. I felt like I connected with almost every character because I either knew someone like them or I’ve heard of someone like them. Coming from a Chinese family, I could really relate to some of the gossipy females in the book – because come on, everyone has an auntie that seems to know everyone’s business! Unfortunately, the changing perspectives also limited the time you got to spend with each character. I’m not sure about everyone else, but Astrid and Michael’s story was the one that intrigued me the most. The novel left their story hanging in the wind, and I feel a little dissatisfied with that. I really wanted to know whether everything would be alright with them, but I guess it’s fun to guess too. One thing I’m a little confused about is Peik Lin and her family’s motives. Her generosity was a little alarming, and I’m not quite sure what the chapter with her and her dad visiting the old man to glean information on the Youngs was all about. At first I thought she was going to betray Rachel and try to steal Nick, but the story didn’t go in that direction. She was such a wonderful friend to Rachel, and I love her for it, but yet I’m still a little confused by her motives. However, the only thing I didn’t like about the novel was its ending. Once again, I must point out that many storylines remain unfinished as Kwan probably wants his readers to use their imagination to finish it off. Like all good stories, this method in letting the readers decide whether the characters end up happy works quite well – but I’ve actually become way too invested in them and I’m itching a little to know. At least we had a little closure with Rachel and Nick’s storyline … but here’s to hoping that Mr Kwan will write a sequel (*nudge nudge*). But even with that ending, I can’t seem to fault this novel at all. It’s just so well written and I love that it’s set in our Asian backyard. 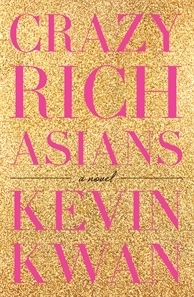 Something this good is hard to come by, so now I’m crossing my fingers for Crazy Rich Asians to make it to the big screen. The book and its author deserves all its hype and popularity, and so much more! Thank you to Allen & Unwin for providing me a copy in exchange for an honest review.